Samsung has today officially announced the arrival of the Galaxy S II in the US. The phone will be coming to Sprint, T-Mobile and AT&T in an effort to capitalize on its success elsewhere in the world. There are three variants of the device, one for each carrier, although most of the specs are identical. The Samsung Galaxy S II has a 1.2GHz dual-core processor, 16GB of storage, a 4.52-inch Super AMOLED Plus screen, an 8 megapixel rear-facing camera and a 2 megapixel front-facing camera. 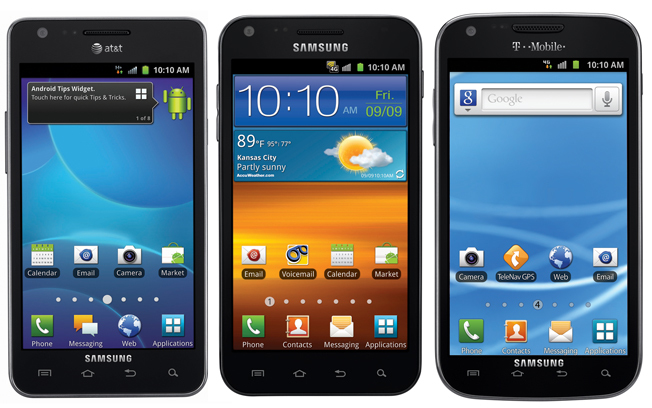 The AT&T version of the Galaxy S II uses a 4.3-inch version of the display instead of the 4.52-inch and AT&T claims that it is the thinnest of the three models at 8.89mm versus Sprint’s 9.65mm. The Sprint version is called the Galaxy S II Epic 4G Touch, what a mouthful, and will support Sprint’s 4G WiMAX network. The T-Mobile and AT&T devices are simply called the Galaxy S II and both support HSPA+ or ‘3.5G’. As you can see from the images above, the Sprint (center) and T-Mobile (right) versions of the Galaxy S II have a slightly more rounded casing, especially at the corners. The Galaxy S II has been a watershed success for Samsung, selling over 1 million units in Korea by May and 5 million units worldwide in June, even before hitting the large US market. It has proven to be the closest single-device competitor to the iPhone 4, which sold some 20.3 million units in the last quarter alone. The Sprint version is set to be released on September 16th, for $199. The AT&T version will be available September 18th. The T-Mobile version will be coming ‘in the fall’ and pricing has yet to be announced, although we would be surprised if it was any different. And if you’re in the mood to see someone get sick while unboxing a Galaxy S II at 8000 feet, check out our own Matt Brian doing so here.